Description: I was offline for last two weeks, so I spend spare time with my latest project. 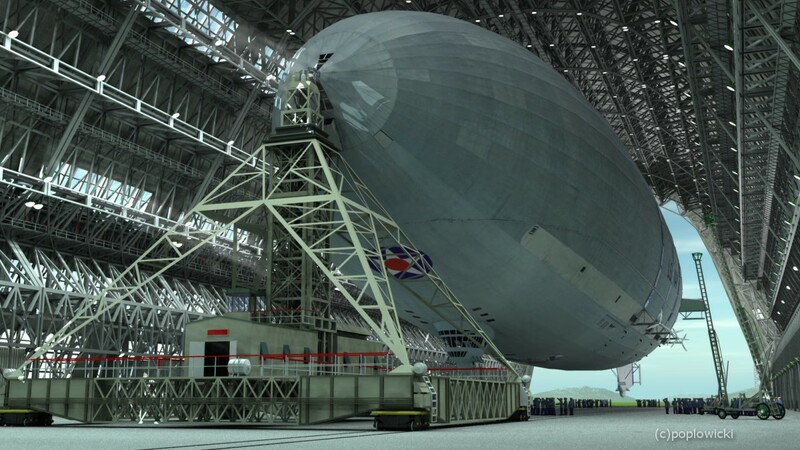 this is Macon airship of USNavy in mid-thirties in her hangar. This looks absolutely amazing, tons of detail, accuracy and taste. Really really great job 5/5, make sure to submit this at DAZ too they will love it. Wow I even thought it was a photo at first. Very impressive work. You definitly deserve more than a 5 on this. But alas it will have to do. Great job! Awesome piece of work, superbly lit. A fiver for sure. rashadcarter, the pro version is less then 200 if you already have platinum membership. Also, standard is good too, it only lacks a couple of modeling tools, exporters, a vector graph editor and ability to save radiosity. but then again I don't know what will be the difference between 6 pro and 6 standard. Thanks for your comments. This scene was rendered at 1600x900 px with quite high quality settings - but not "the top". It took around 17 hrs to render.. Grass & people - points taken (lazy, lazy popgriffon). Lighting: 1-distant light (sun converted to distant) from behind camera upper left (white 30%). 2 -anything glows on most distant lamps (blue-white-grayish 50% short ranged) - these simulate outside light falling thought open doors (highlights on ceiling and airship body) 3 -yes almost 500 spotlights in places of the lamps (white 2% very short range, very broad angle) 4 -two "flashlight" spotlights behind and aside the camera (even shorter range one yellow-gray second blue-gray 10%) 5 -GI sky light 131%, indirect 96% I use Carrara Std + Transposer. Carrara Pro has also inbuilt Transposer. Holy Plata that awsome Good Work!!!! Popgriffon, it's been awhile since I had the chance to see something like that here. To say Great it is just not enough. So much detail, so much dedication within this image. Excellent texure on the Macon, there's even an inscription on the left side "U.S. .." it reads. Sky color is 100% convincing, floor shader seems fine, as I know large space floors (or massive terrains) require additional dosage of attention to make them look right. Astounding render, one of my most favorite here on the site. Popgriffon, you're getting really good with Carrara and Hexagon and that's the way it should be! Keep up, bro'! I'm sure by 'crtl-d' you mean that quite a bit of it was done with duplication. Even then I don't know if I'd have the patience to tackle a project with this much detail. It's quite astounding what you've done here. I must say once again...Freakin' Amazing work! At this point, you could be working for a major Hollywood studio raking in big bucks. I am just plain dumbfounded by the specificity of the image. The organized complexity, the perfectly tempered lighting...MASTERFUL! Thank you for this work! Two weeks should be understood as "two weeks for modeling the hangar".. The airship was prepared earlier, also historical data was gathered for several months before I fired Wings.. It usually takes looot of time between planning and releasing of my image. In this image, apart of tricky lighting setup, there's no spectacular tricks used - no volumetric objects, particle emitters, 3D blur, replicator, lighting effects.. So it's "Carrara without fountains" - That software can do more. To see this, useful thing to do, is to visit polyloop.net and download 3dXtract ezine - full of tuts (IMHO useful also for non-Carrara'ers). Maybe also my animation (related) what i've put @ YouTube could be interesting - There 3D clouds and modifiers (spinning props) were used.